The first attempt at the 1600m distance proved little concern for promising galloper Flavigny (pictured) when she bounded away to take honours in the Weekend Herald Rating 85 event today at Ellerslie. Rider Mark du Plessis rode the daughter of Mastercraftsman closer to speed than usual, which appeared to be the winning of the race, as she cruised to the lead at the top of the straight and proved too strong over the concluding stages despite the late efforts of Staccato. 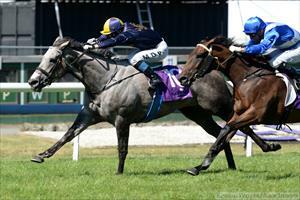 “She has been racing generously in her races, so the 1600m was not going to be a concern.” Co-trainer Chad Ormsby said. Carrying the colours of Windsor Park Stud, Flavigny has now recorded three victories from her relatively light race career to date and looks a runner destined for black-type success in the near future.